As you can see the holiday quilt is progressing. Not quite as quickly as I would have liked, but still. I have 12 more blocks to make and put on then just the outer borders. I am really hoping I can finish the top and start quilting it on Monday. I like the idea of rounding off the FOQ with a new bed quilt and the way the temperature has been dropping here we will need it soon. 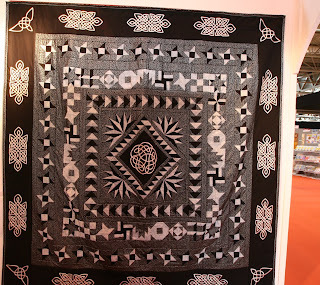 I am really pleased with the black in the quilt. I was concerned it would change it to much and I wouldn't like it as much as the original but I didn't need to worry. 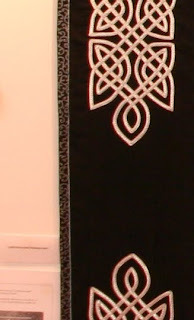 Of course I like black :) The inner borders/sashing is slightly wider than the pattern called for. I am trying to make this into a king size quilt from a large twin, so I am adding where ever I can. I also fancy having a bit more space to play with the quilting. I haven't quite decided what the outer borders will look like, but I have a couple of ideas. So long as I can get the size I don't really mind. I've now got time to go back to some of the projects I was working on before the gallery came up. 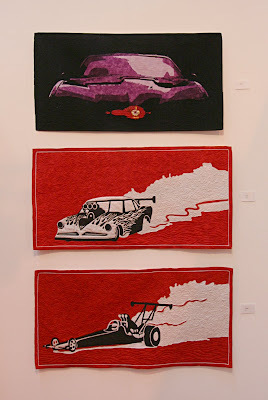 One of those is Speed Quilt. I am looking to publish the patterns for all the designs and I would love to include pictures of quilts that have been made in classes. If you would like yours to be one of the featured quilt please get in touch. Also if you know someone who has taken the class pleas do pass on this plea. Today I had a very simple plan. Drive to Kent, see the osteopath, drive home, sew. See nothing to it. Until I got to the traffic jam on the M25. They had closed one short section and it has caused chaos. I left home at 9am. I turned around 2 jusnctions before the roab closure and I still haven't made it home at 3pm! Still all is not lost. There isn't much you can do when you are stuck in traffic and you are the driver, but you can think and plan. At the NEC I bought some rather nice fabrics, and didn't entirly have a plan for them. I do now. The Farbstoff cotton sateens I will make a very simple quilt. It will have very minimal piecing and a lot of space for quilting. If I've got the maths right I might have enough fabric to make two similar quilts which could be fun. 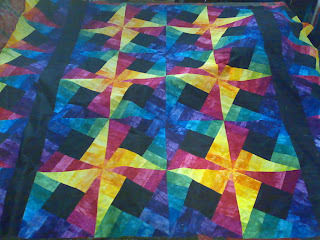 The idea is to really show off the hand dyed fabric, but include the shaded colour packs and make a large bed quilt. I'm looking forward to getting home and measuring up. I also bought a selection of Oakshott fabrics. I've been looking at these for some time but never bought any as I didn't realise they sold yardage. They do and I have enough to make something really fun. I think I have most of this quilt worked out too. It's a lot more complex which worries me a little. I have no idea how stable the Oakshott will be. I guess I will find out. I can't wait to get home and draw these up. So enough chat. I'll finish my drink and get on my way. So we left the gallery through the second entrance next to the nudes, we will now turn right and walk around to the first entrance we saw in FOQ - Overview. 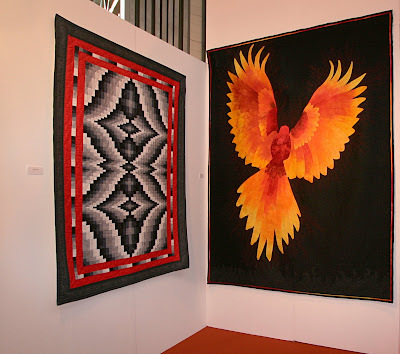 The first quilt we come to, 'Flying Feathers' was also the hardest to photograph. White wholecloths seem to resist any attempt to get good pictures of them, still I think you can get a general idea from the photos. 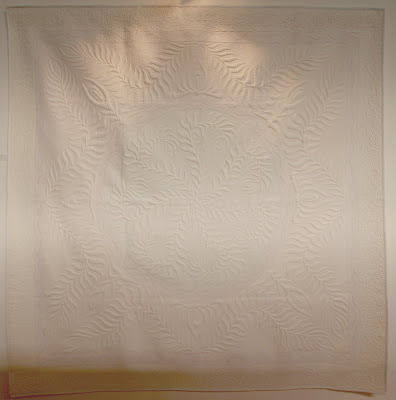 This quilt was made as an attempt to please show judges, and I hope it is my first and last white wholecloth. 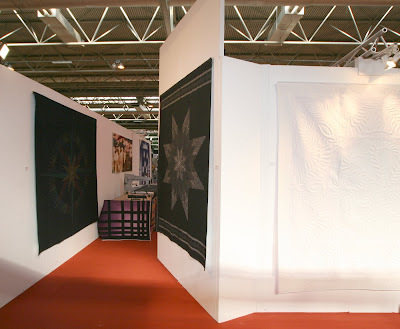 Although technically it is the second white wholecloth, the first never made it to completion. 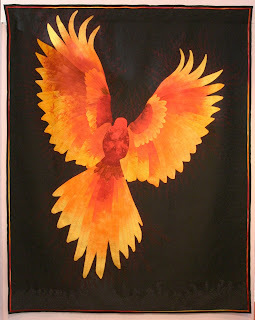 I had planned for this quilt to have shadow trapunto, I was going to fill the raised feathers with black wadding so they would show grey in the finished quilt. To work, this requires a fairly translucent top fabric. It turns out I really don't like quilting on that type of fabric. Strange I know but true, I hated it. I didn't like the feel of it, and I didn't like the look of the stitches. Plan B. I love working with cotton sateen but it was a lot harder to mark. Still quilting on it was a lot easier and the double wool wadding gave a good trapunto effect. However this quilt hadn't finished causing trouble. The machine played up, I ran out of the pink thread and then it's final trick was to break my cheek bone. While I was packing the quilt it managed to flick an empty beer bottle into the air, which l anded on my face. If you find the photographs from last years Festival you will see I had a black eye. Moving on we come to a pair black wholecloths. 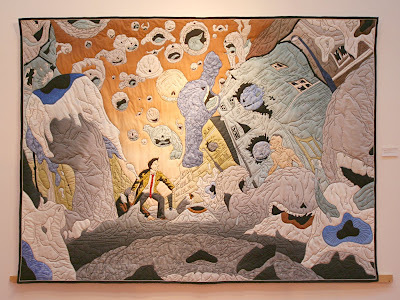 'Guide Me' is another quilt that is the second generation quilt. It is the one where I started always matching my bobbin thread to the top thread. I got about half of the way through the quilt when I decided I couldn't live with the occasional spots of the top thread on the back so I started again. Of course being me I was on a very tight deadline and what happens when you are in a hurry? You make mistakes. I managed to quilt what should have been a blue area in green leaves. It took me about 12 minutes to quilt it, and over 12 hours to take it out. I don't recommend making mistakes on cotton sateen, it is a nightmare to unpick on. 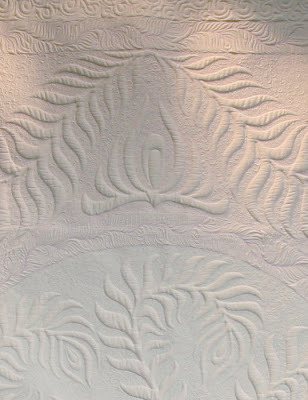 This quilt is one of my most traveled pieces, and won the traditional machine quilting award at the World Quilt Show last year. 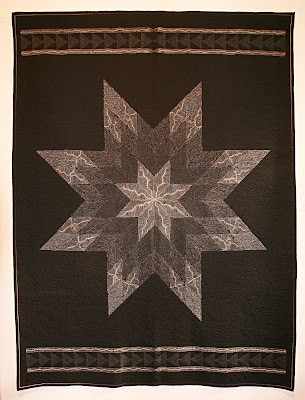 Facing 'Guide Me' is one of my favourite quilts, 'Winter Star'. It is another wholecloth, this time on plain black cotton. 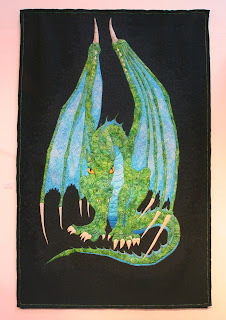 It was made to hang in the Longarm Gallery at the Festival of Quilts 2007. The design had to be monochromatic with one colour. The main design is stitched in a range of grey threads. I marked the piecing lines, but all the fill in stitching is free hand, as are all my quilts. The colour is hard to spot, especially in a photograph, it is in the piping. 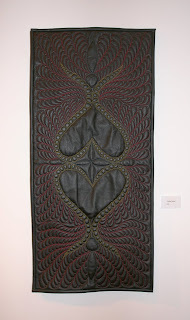 As we go into the gallery you can see 'Dawn and Dusk' pinned to the end of my quilting frame. 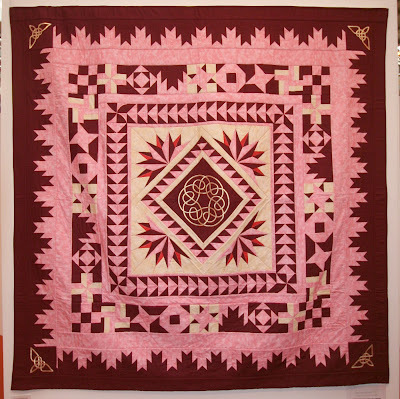 This is the quilt from our first self published pattern of the same name. 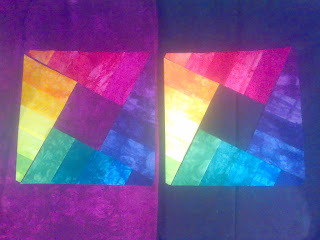 It is a reversible quilt which uses ombre (shaded) fabrics. If you would like to purchase the pattern for this quilt use the contact me button to the right to get in touch. 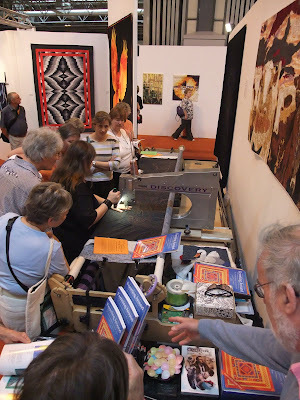 Moving on across the gallery we come to 'Herd Mentality' hanging over my longarm quilting machine, which we will come back to in another post. 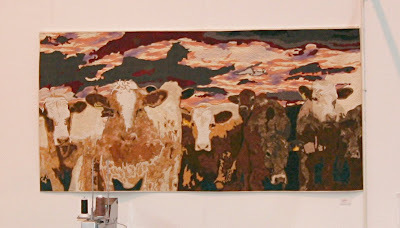 'Herd Mentality' was inspired by a herd of cows I met. When I say cows I am not entirely accurate, but then neither was the farmer who asked if I minded cows, I don't. I do mind bullocks. Quite a lot actually especially when they are trying to mount me. Very flattering but really not my type. Once there was an electric fence between me and the 'cows' I grabbed a camera and took some pictures. It was sunset and with the fantastic sky they looked really impressive. 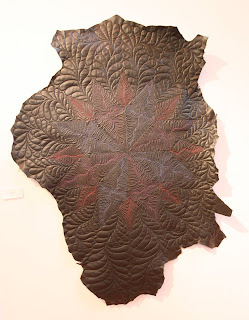 The first time I showed this quilt was in my gallery at the Dissenters Gallery I was surprised at the effect it had on people. They played the sky game, where you look at the patterns in the clouds and see what you can find. It kept people entertained for ages. 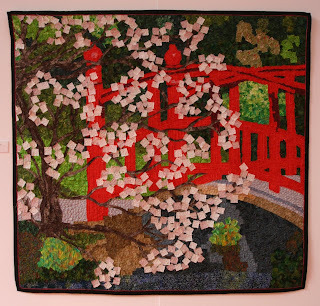 After the FOQ 2008 where it won the pictorial prize it went on to the Houston Quilt Festival. I was a little shocked when it won the visitors choice, but really surprised when I found people blogging about the pictures they in the sky. I guess the sky game is international. I did notice that people from different countries do see different things in it. What do you see? Moving on across the gallery there is 'Where is the North Star?'. Do you remember I said I had some "seemed like a good idea" quilts? 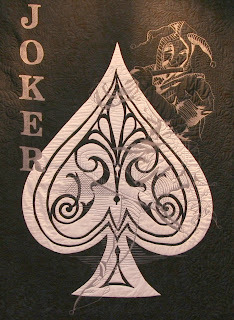 Well this is the quilt I was thinking of when I said it. I guess I should start by saying I am very pleased with how the quilt turned out, getting there wasn't so much fun. The whole quilt is foundation pieced. That part was simple and gives a good mottled effect to represent the night sky. However I had decided it would look more organic and natural if I offset all the blocks around small squares. Well yes it does, but.... To assemble this quilt I had to lay out all the blocks on my bed and position all the small squares. I then grabbed a few pieces and went downstairs to sew them together, a time consuming process given all the partial seams. Then back upstairs to pick up the next pieces, of course by then the cats were on the pieces, so I picked up a cat, removed the pieces of quilt from it's feet and put the next bit together. Just sewing the blocks together took all day, from getting up to going to bed. Finishing the top with it's borders wasn't a problem, and then it went on the longarm. This was only the second quilt I managed to persuade my machine to sew on. The quilting went very well. 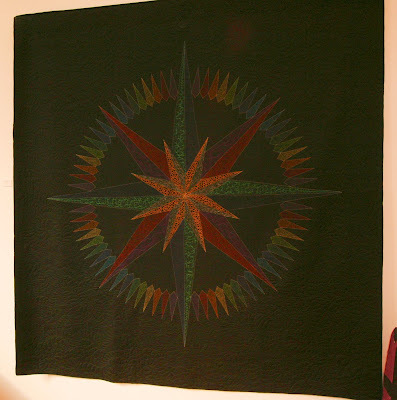 I made a star guide so I could put little stars in to the quilting and it was done a couple of days before it had to go to a show. Next came trimming up. 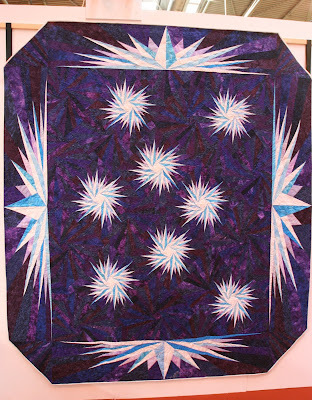 I generally make my quilts a little bit larger than I want them and trim them to size, but as I said this was one of the first I had quilted on the longarm and I had foundation pieced the borders with very little spare. Three corners squared up perfectly, the fourth was another story. This was the moment Tet decided to explain the problem with quilt to me. The bottom corners of a quilt on a bed can be quite a trip hazard as they stick out, so he suggested I cut them off. Just a safety feature honestly. Well it solved the problem and I love the look of the quilt. I wish it didn't have white binding, which looks great but is a dust magnet, but I am very fond of this quilt. It is the quilt people most often request as a patter, but I'm sorry I won't be writing it. I like to produce patterns that work and people will achieve without going mad, this just isn't it. 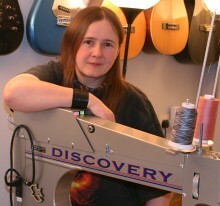 My name is Vanessa, and in an attempt to redefine myself, I stumbled across Patchwork Corner and went in for a look. £182 later, I came out and felt I had found my soul. Things have never been the same since. Six years on and Thursdays are still my favourite day of the week when I attend a class at the shop. There's always something new to learn. I now know what the first correction is for the second edition, I just hope it isn't too long before I can do a second print run and get Vanessa back into the book. I am so sorry she missed out on this edition. I know every book goes out with an error but did it have to be this big? On with the show. 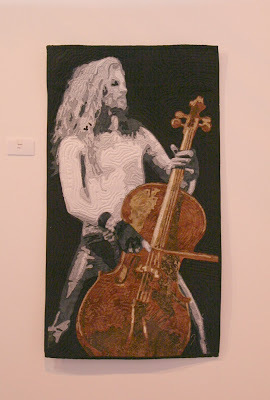 I have to admit those are some great photos, especially the close ups of my quilting. Thank you so much for crediting me too. Then I got thinking, if I am going to publicise one why not all of them. Some give interesting alternative perspectives on the show. Bear in mind my perspective went something like, person - question - answer - person - question - answer. It was just so busy I don't think I had time to really take it all in. The first one on the list goes just to a blog as there are two posts that really seemed to capture the event for me. If you come across any more that deserve a mention please do let me know. I like to see where my work wanders off to when I am not looking. As you can see my holiday quilt is progressing. I am ready to make the blocks up now. As I want to make the quilt larger I will need to add fabric to the kit. 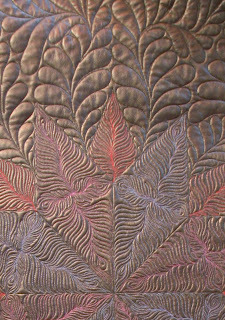 I don't have any appropriate hand dyed fabrics but the very dark batik looks pretty good. Initially I thought about just adding borders but I think it will look more planned if I use the batik in the centers of the blocks too. It will make my version a bit darker and I suspect more extreme. I think those are assets, so time to cut the batik. I spoke to a lot of ladies about the APQS machines at the show, don't forget to drop me an email and I will put you in touch with the UK rep. So it appears we will start our tour through the central door of the gallery, the archway. I am sure Jan will be very flattered you picked his door first. Before we go in lets take a look at the quilts to either side of the door. To the Left we have 'In Full Bloom'. 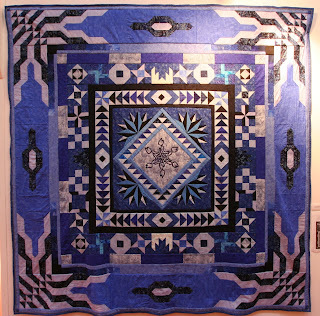 I made this quilt for the Celebrate Spring show in Chicago. 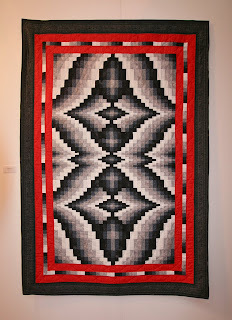 I think that was my first go at a juried show and this quilt made it in. I was thrilled. The quilt came from spending far too much time at the National Gallery (is that really possible) and falling in love with the impressionist paintings. I hope at some point I will make more quilts in this style. If you look closely (you can click any of the images to see a bigger version) you can see the whole quilt is made up of 1" squares. This is how I felt I could best represent the sometimes blocky brush strokes. 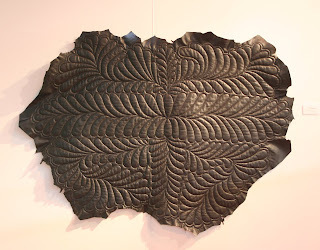 In the detail picture you can see that the quilting is designed to fit the texture of the item being represented, right down to every blossom having a flower in it. 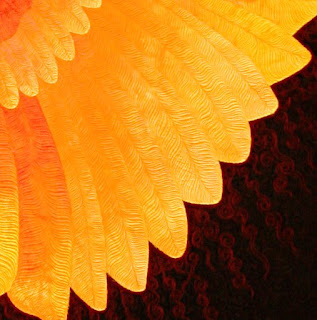 To the other side of the archwayy is 'Radiance'. 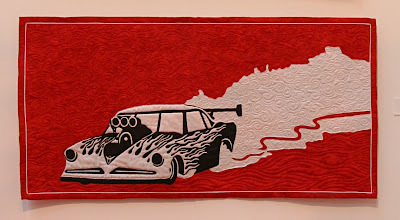 This is one of the very few quilts I have on display in my house. I don't have much wall space but this fits nicely on one chimney breast. I really aught to get it unpacked and re-hung. It was on display here last year where it was awarded 'Highly Commended'. 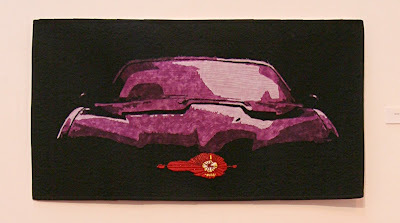 It is a whole cloth on plain cotton stitched in four shades of purple. 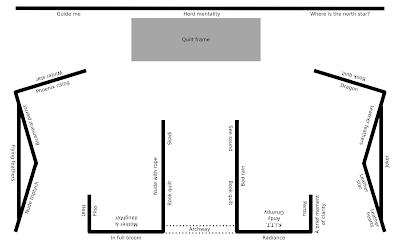 When I was planning the gallery this space was designed as the neutral area. The fulcrum that supported the rest of the gallery. It gives you a great framed view of 'Herd Mentality' on the center of the back wall. 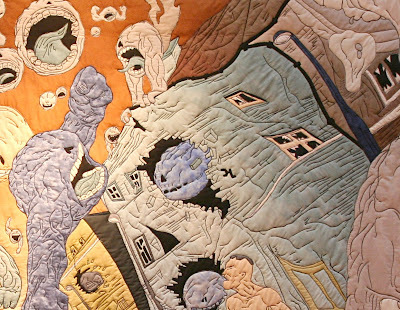 This quilt seems to have a fan base all of it's own, and many of them have followed it around America and back home. This is a good point to thank all the ladies at the international quilt festival for getting this back to me so quickly after their last show. I would have been in trouble if it hadn't made it back. As we go through the arch my sample book quilt is hanging on the right. 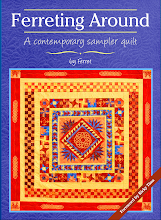 I had always intended this to end up as the cover quilt, but I was advised against using it. I trust the people who I ask for advice, so it had to make do with just being in the book. One of the perks of having my own gallery was being able to handle the quilts when I needed to and to allow others to do the same. A pair of ladies bought the book on Thursday, went away and read it then came back with a question on Sunday. They were worried the seams would be overly bulky, after feeling this sample they were satisfied there isn't a problem. It was a great feeling. 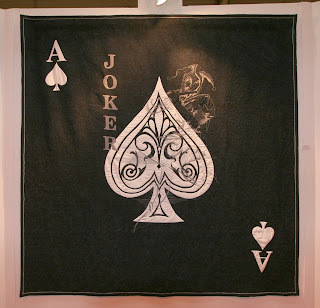 The quilt is inspired but the black and silver fabric. I had decided I would make a sample up in only three fabrics to show it could be done and then this fabric came up and I fell in love. It is a lovely fabric and I like it as the background to this quilt. 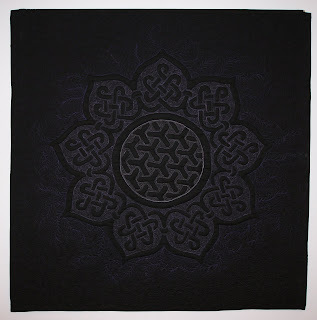 I had intended to bind the quilt with plain black the same as the outer borders, but I ran out of fabric. So I was forced to use the black and silver again. What a lucky accident it looks much better than black would have done. The quilt opposite is Tet's first quilt, and you can see him with it here. He was proofreading the book and decided the only way to do it properly was to make the quilt, and on his own. I was banished from my sewing room, my machine commandeered, and my stash raided. I can't complain he turned out a great quilt. 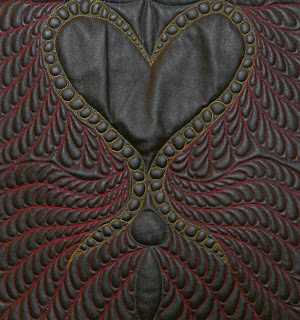 It also has a much more exciting back than most of them, even though all of the book quilts are reversible. 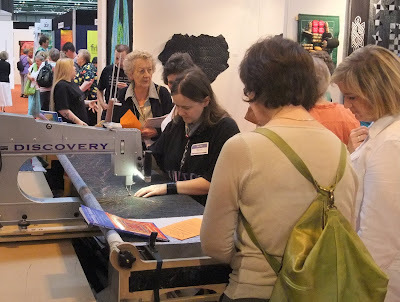 If you are lucky enough to catch us at a talk you might be able to get him to sign his quilt in the book too. Next to Tet's quilt is a very important little quilt. It is a portrait of one of my six cats, this one if called 'Skadi'. She is significant for two reaso ns. Firstly she was my first award winning quilt. Not only that she won a prize in the first show I entered and she was judged by an artist who makes a lot of stitched animals, and she gave me tips on how to improve my work. It's a very special award. 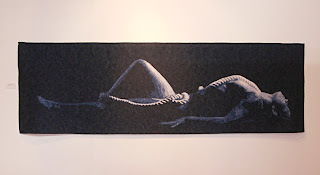 She is also the quilt that started all my pictorial quilts. 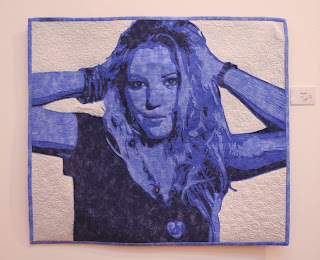 I made her as part of a Quilt University class with Marilyn Belford. She wasn't initially keen on me doing an animal, the class was for human portraits, but she let me take the class. 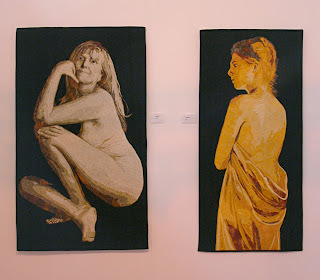 The skills I learned there have allowed me to make all my other art quilts. I may have evolvesdmy own ways of doing things, but I don't think it would have happened if she hadn't let me do my own thing. 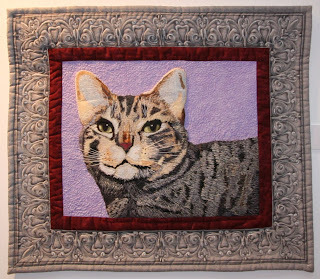 This quilt is always one that draws people in, she does look amazingly furry, and it is hard to resist stroking her. The border also fascinates people. Yes it is a printed fabric. Yes I did buy a lot of it, it's fabulous. 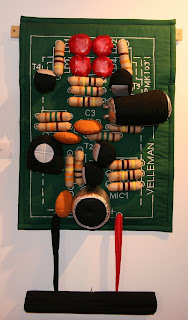 F inally in this section we have 'See Sound' it's another one of my older quilts. 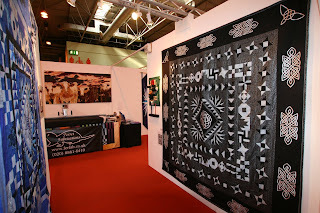 It's come home this weekend as it was designed specifically to be hung at the Festival of Quilts. 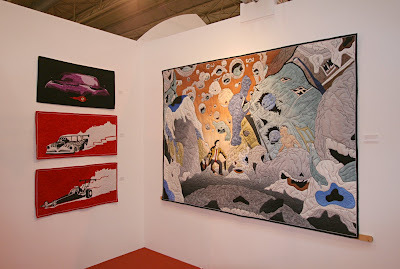 It was when I was walking around the Festival one year when it struck me that quilt were missing out at shows. 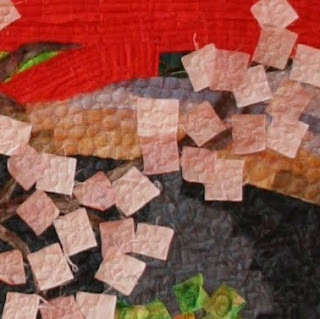 Part of the appeal of a quilt is it's tactile quality, in shows it isn't able to share that. 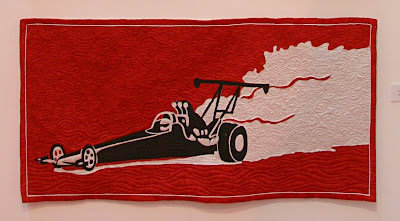 I knew I wanted to give a quilt a new dimension. It had to be something that didn't involve the quilt being touched, and I decided that sound would be a simple thing to use. 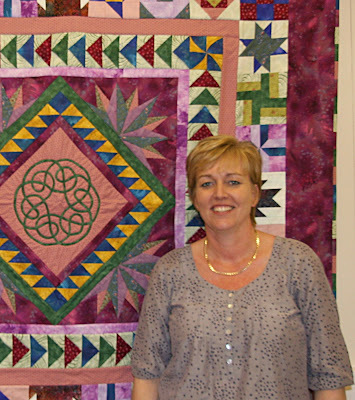 After all quilters stand in front of quilts and talk. 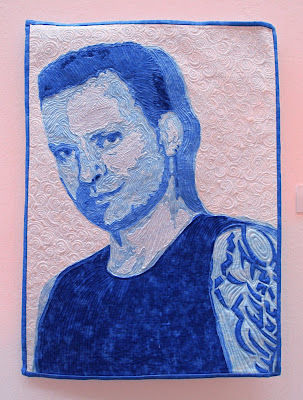 I also wanted to see if I could make a quilt that would talk to more of the men who come to the show. Of the UK shows the Festival is the one with the most men at it. I admire them coming to support their partners, but I've also noticed how wilted they look after a few hours. This quilt worked very well for that too. I saw several men walk around it and then start explaining the circuit to their wives, who then wilted. It was fantastic to watch. The quilt is actually double sided, the back have solder spots and the tracks of the board. Well that's your lot for today, the new poll is do we turn left or right. Left will take us towards the Phoenix and right would be towards the Dragon. Let me know by voting in the poll to the right of this post. Continue the tour.